That’s why it’s so critical that we ask ourselves — before we’re mired in pain — what is going to last? Consider what happens when we’re tempted. Temptation is not just a battle between good and bad, or, what’s best and what’s not best. The Bible teaches us to “fix our attention, not on things that are seen, but on things that are unseen. 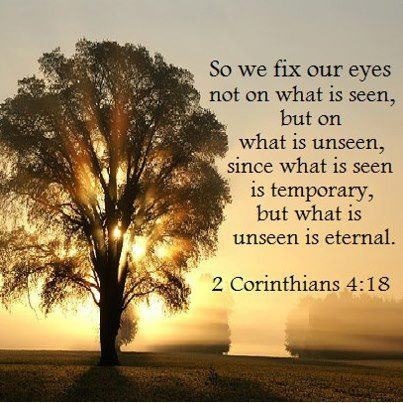 What can be seen lasts only for a time, but what cannot be seen lasts forever” (2 Corinthians 4:18). I John 2:17 — The world and its desires pass away, but whoever does the will of God lives forever. I John 5:11b-13 — God has given us eternal life, and this life is in his Son. Whoever has the Son has life; whoever does not have the Son of God does not have life. I write these things to you who believe in the name of the Son of God so that you may know that you have eternal life. This entry was tagged eternity, temptation. Bookmark the permalink.